From: Greta Gaard, Fairhaven College, Western Washington University, Organization & Environment 10:4:441-442. December 1997. “Why video?” I asked Al Gedicks, the sociology professor at UW-La Crosse who had scripted and produced this documentary. 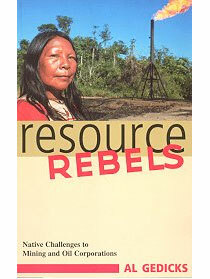 Clearly, his book The New Resource Wars (1993) offered thorough documentation of the multiracial coalitions against mining in Wisconsin and contained more information than could ever be conveyed in a video. “Simple,” Gedicks replied. “Maybe a couple thousand people will read the book, but tens of thousands will see the video. And someone needs to document the fact that there is this developing alliance between environmentalists and native people. The mainstream media isn’t doing it. Instead, they’re going along with the corporate version of events–downplaying the alliance between tribes and environmentalists, even pretending that it doesn’t exist. It’s up to us to reconstruct this story from the point of view of those who participated in the struggle” (A. Gedicks, personal communication, March 1997). Gedicks is clearly the person to do it. In 1990, Gedicks produced a documentary examining the first Exxon battle in Wisconsin, fought over a decade from 1976 to 1986; this video shared the title of his book, The New Resource Wars (1993) and drew parallels between copper mining in Wisconsin, uranium in New Mexico, and coal in Wyoming. In 1993, Gedicks focused on the Kennecott-Rio Tinto Zinc mine in Ladysmith, Wisconsin, foregrounding the emerging grassroots alliance among natives, environmentalists, and local citizens against mining. Whereas Gedicks obtained grants to fund the first two videos, Keepers–his third documentary in the series–is funded entirely from the proceeds of the first two videos, and Gedicks is working to distribute it himself. Yet he has maintained the same professional quality in shooting and editing, the same reasoned presentation, and certainly the same urgency in his message. Gedicks begins the video with a focus on the subject in dispute:water. Exxon and Rio Algom of Canada have proposed to build a copper-zinc metallic sulfide mine and toxic waste dump on the banks of the Wolf River near Crandon, in northern Wisconsin. Currently designated as an outstanding natural resource water (ONRW), the Wolf River offers fresh water for drinking, habitat for numerous species of fish and wildlife, and recreational opportunities for residents and visitors; the lower half of the river is protected as a National Wild and Scenic River and is enjoyed by rafters, kayakers, and canoeists alike. Exxon’s proposed mine threatens the purity of the water, the livelihood of the local tourist and recreation industries, and an entire way of life for the Sokaogon Chippewa tribe. The mine and tailings sites lie just 1 mile upstream from Rice Lake, a vital source of food, water, and spiritual renewal for the Chippewa. Adding to the testimony of natives and environmentalists, Gedicks gives us visuals explaining why the mining industry is not to be trusted. With footage from the March 1989 Exxon Valdez oil spill of 11 million gallons in Prince William Sound, images of acid mine drainage from an abandoned mine site in Helena, Montana, and graphics illustrating the relationship between tailings ponds and water tables, Gedicks makes his point. Already, there are 52 abandoned mine sites on the Superfund cleanup list. Rice Lake and the Wolf River need not become number 53. Environmentalists and native activists in Wisconsin know this. In the state’s 1997 legislative session, Rep. Spencer Black will reintroduce the Mining Moratorium Bill, which prevents the state from issuing mining permits to any corporation until it can find a mine in the United States or Canada that has operated safely and has been closed for at least 10 years without polluting surface or ground waters. Earth First! activists in Madison have already begun touring the state with Gedicks’s video, informing communities of the impending legislative struggle for clean water and native rights. 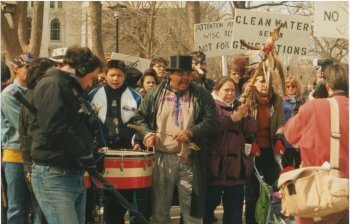 The Mole Lake Chippewa tribe has bought 200 copies of the video to distribute, and Gedicks is making copies available to activist groups to raise funds and mobilize resistance. Keepers is a documentary whose relevance will last beyond the immediate struggles around the Wolf River. By giving us visual proof of citizen activism, Gedicks offers us a vital supplement to the one-eyed vision of the mainstream media. The potency of citizen activists saying “no” to corporate control–the growing multiracial alliances between natives and environmentalists–these give us hope that democracy will not be bought by the corporations. Gedicks’ video is news from the underground. It lets us know we are not alone.